Inroma Dental (Delray Beach) - Book Appointment Online! Inroma Dental wants you to have a wonderful experience every time you visit us. Let us become your preferred affordable dentist in Delray Beach, and West Palm Beach. You will not be disappointed. 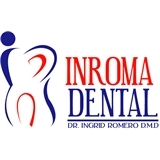 Dr. Ingrid Romero’s charisma, experience, compassion, and gentle hands set her apart from other dentists. You will notice the difference from the first visit. Le ofrecemos todos los servicios y tratamientos dentales disponibles en el la ciudad de Delray Beach – West Palm Beach con equipos de alta tecnología, y lo más importante con la experiencia, carisma, calidad humana hacia sus pacientes y compasión de la Dr. Ingrid Romero, DMD quien hará de su visita a Inroma Dental una agradable experiencia desde la primera vez. Dr. Romero is very professional, kind, and knowledgable. She answered all my questions, and she took her time attending me. Everyone in her office was warm, and inviting. Overall a very great experience.